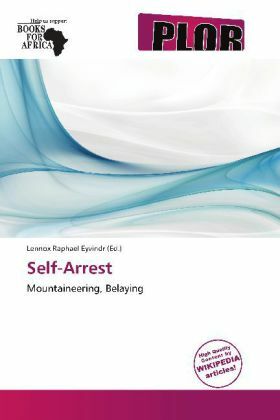 Self-arrest is a mountaineering related maneuver in which a climber who has fallen and is sliding down a snow or ice slope arrests (stops) the slide by himself or herself without recourse to a rope or other belay system. Self-arrest can be performed by using an ice axe or by using the climber's hands, feet, knees and elbows. Self-arrest with an ice axe is a difficult maneuver, but without it the probability of effectively arresting a fall is greatly diminished. The most important part of the maneuver is to get into self-arrest position. In this position the climber is face down with feet oriented towards the valley, arms tucked in, one of the hands on top of the ice axe the other down the shaft. The top of the axe is against the shoulder or its vicinity and the pick of the ice axe in contact with the slope. Once in this position the climber arcs his body, so that it contacts the slope mainly in three points, the pick and his feet or knees, in order to bring as much of his weight to bear on the pick as possible.